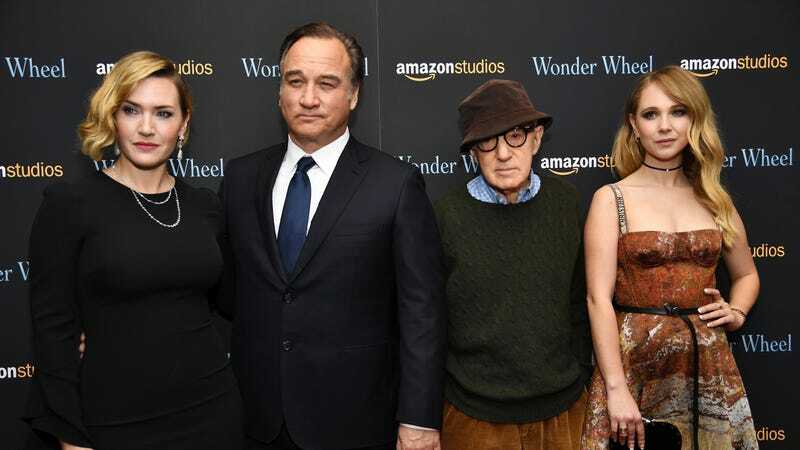 Woody Allen with cast members from “Wonder Wheel” at a November screening. Image via Getty. We could review the allegations that Woody Allen molested his daughter Dylan Farrow, but what’s the point? These allegations have been public for a quarter of a century. While a small handful of Allen’s former leads (Colin Firth, Rebecca Hall, Mira Sorvino, Greta Gerwig, Chloe Sevigny, Rachel Brosnahan, Ellen Page) are speaking up now, most have avoided the question for decades. The tides are only turning because Dylan Farrow has had to relive the experience for 25 years. Jezebel has reached out to Amazon for comment and will update the post if we hear back.